Addis Ababa, Ethiopia, 29 January 2018- The 30th Ordinary Session of the African Union (AU) Summit holding on the theme: ‘Winning the Fight Against Corruption: A Sustainable Path to Africa’s Transformation’ ended on 29 January 2018, at the AU headquarters in Addis Ababa, Ethiopia, with the adoption of key decisions by the Assembly of Heads of State and Government. The realisation of a Single African Air Transport Market is vital to the achievement of the long-term vision of an integrated, prosperous and peaceful Africa under the AU Agenda 2063; that it will bring about the enhanced connectivity across the continent leading to sustainable development of the aviation and tourism industry with immense contribution to economic growth, job creation, prosperity and integration of Africa. Its against that backdrop the Assembly adopted the Decision on the Establishment of a Single African Air Transport Market (SAATM). Twenty-three (23) Member States have declared their Solemn Commitment to the immediate implementation of the Yamoussoukro Decision towards establishment of a Single African Air Transport so far. On the African Continental Free Trade Area (CFTA), the Assembly decides to hold an Extraordinary Summit on 21 March 2018, preceded by an Extraordianary Session of the Executive Council on 19 March 2018 in Kigali, Rwanda, to consider the CFTA Legal instruments and sign the Agreement Establishing the African Continental Free Trade Area and requested the AU Commission to convene an Extraordinary session of the STC on Justice and Legal Affairs to consider the said instruments prior to the Summit. The Assembly also adopted a protocol to the Treaty Establishing the African Economic Community relating to Free Movement of Persons, Rights of Residence and Right of Establishment and its Draft Implementation Roadmap. On Financing the Union, the Assembly decided that the membership of the Committee of Ministers of Finance should be expanded from ten (10) to fifteen (15) members based on the principles of equitable geographical distribution and rotation. In this regard, the Committee will be called the Committee of Fifteen Ministers of Finance. On the Report of the Leader of the African Union High-Level Committee on Libya, the Assembly expressed once again its deep concern over the persistent political impasse and the security situation in Libya, which perpetuates the suffering of the Libyan people, undermines the legal institutions of the country and poses a challenge to security and stability in neighbouring countries and in the entire region. The Assembly requested the African Union Commission to re-launch the efforts of the Contact Group on Libya, in close cooperation with the United Nations, in order to pool the efforts of the international community on the issue and support the efforts of the African Union High-Level Committee on Libya and expressed once again, its appreciation to H.E. Mr Denis Sassou Nguesso, President of the Republic of Congo, Leader of the African Union High-Level Committee on Libya, to the African Union Special Representative, H.E. Mr Jakaya Kikwete, as well as to neighbouring countries, for the efforts made towards achieving lasting peace in Libya. On the Report of the Peace and Security Council on its Activities and the State of Peace and Security in Africa, the Assembly welcomed the signing, on 21 December 2017, by the South Sudanese stakeholders of an Agreement of Cessation of Hostilities, Protection of Civilians and Humanitarian Access, and commended IGAD for leading the High Level Revitalization Forum, which presents a unique opportunity for the implementation of the Agreement for the Resolution of the Conflict in South Sudan (ARCSS), in line with the Communique of the 720th meeting of the PSC, held at ministerial level, in New York, on 20 September 2017. The Assembly. The Assembly expressed deep concern over the repeated violations of the Agreement by the parties, resulting in further deterioration of the already dire humanitarian situation caused by the ongoing conflict, and demandn all warring parties to immediately put an end to all military actions and comply Scrupulously With Their Commitments, As Contained In The Agreement Of 21 December 2017. 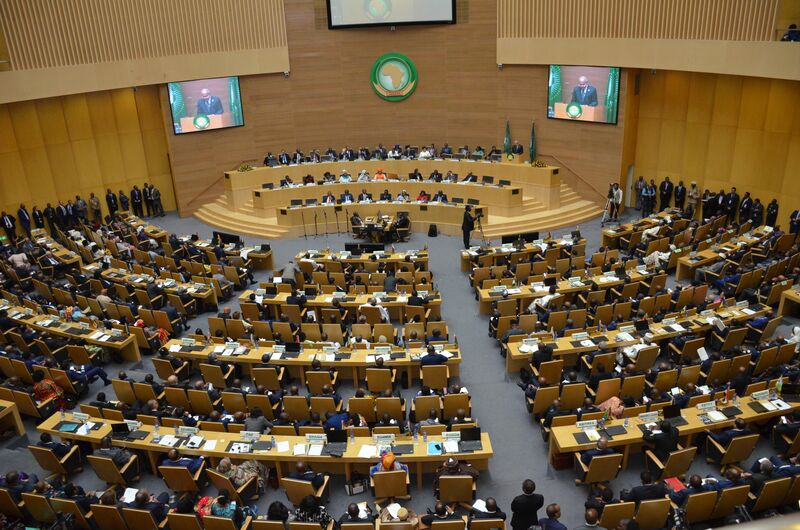 On the Implementation of the Assembly Decision on the Institutional Reform of the African Union, the Assembly reiterated the commitment to the reform and renewal of the Union as part of the effort to ensure delivery of Agenda 2063 as an integrated, prosperous and peaceful Africa, driven by its own citizens and representing a dynamic force in international arena. The Assembly decided that the Reform Troika shall be expanded to the Bureau of the Assembly and will collaborate with President Kagame in his capacity as Lead on the AU Institutional Reform process. On the African Leaders for Nutrition (ALN) Initiative, the Assembly reaffirmed commitment to end hunger by 2025 through strengthening development policies as an effective investment in the human capital of our countries; and recommited to end child stunting by reducing stunting to 10% and underweight to 5% by 2025 and in particular, focusing on the first 1000 Days as the only window of opportunity during which permanent and irreversible physical and mental damage would be avoided. Ms. Amal Mahmoud Ammar (Egypt) as Member of the African Union Advisory Board on Corruption for a two (2)- year term. Mr. NZINZI Pierre Dominique (Gabon) as President of the Pan African University (PAU) Council for a three (3)-year term. The Vice President of the PAU Council will be elected at the 33rd Ordinary Session of the Executive Council scheduled for June/July 2018. The Assembly welcomed the appointment of former Algerian Foreign Minister and former AU Commissioner for Peace and Security Amb. Ramtane Lamamra as the AU High Representative for Silencing the Guns and called upon Member States, the RECs/RMs, the UN and all partners, to extend their cooperation and support his activities in assisting Africa and its people to silence the guns in Africa by the year 2020. The Assembly FURTHER STRESSES the urgent need for the AU to mobilize funding in support of the activities of the High Representative to enable him carry out his mandate, particularly galvanizing efforts of all stakeholders to scale up activities in the implementation of the AU Master Roadmap. With regard to the New Partnership for Africa’s Development (NEPAD), the Assembly reaffirmed the continued relevance and uniqueness of accelerating the implementation of Agenda 2063 and, the vehicle to enhance multi-sectoral and integrated approach to deliver transformative results as enshrined in the NEPAD Programme and the role that the NEPAD Agency plays and that will be reinforced in the proposed transition of the NEPAD Agency into the African Union Development Agency. On the Implementation of the Solemn Declaration on Gender Equality in Africa (SDGEA), the Assembly called Member States to implement all the commitments made in the SDGEA, and the AU Commission to accelerate the alignment of its policies, programmes and reporting tools for gender equality with Agenda 2063. On the Report of the African Peer Review Mechanism (APRM), The Assembly congratulated H.E. Idriss Itno Deby, President of the Republic of Chad.for his election as the new Chairperson of the APR Forum, and commended H.E President Uhuru Kenyatta for his sterling leadership of the Mechanism, including its Revitalisation, during his tenure as the Chairperson of the APR Forum. The Assembly further reiterated that the APRM remains the premier homegrown, African good governance tool conceived in 2003 and voluntarily acceded to by thirty-six (36) Member States, more than half of whom twenty-one (21) have under gone the review. On Fast Tracking CAADP-Malabo Commitments for Accelerating Agriculture Transformation in Africa through Biennial Review Mechanism and Africa Agricultural Transformation Scorecard (AATS), the Assembly commended the positive response of Member States in conducting self assessments, inclusive validation process and providing information for the preparation of the inaugural report to the Assembly of the African Union on the progress in achieving our common goals on agricultural transformation in Africa; while noting challenges faced by members states in collecting and compiling quality data to report progress on all goals and targets set in the commitments of the Malabo Declaration. The Assembly called all Member States of the African Union, to mobilize adequate technical and financial resources in supporting agricultural data systems, monitoring and evaluation systems and strengthen mutual accountability structures to trigger evidence based planning for agriculture transformation. On Outcomes of COP 23/CMP 13 and Africa’s Engagements at the Global Climate Change Conference at COP 24/CMP 14, the Assembly urged developed country Parties to scale up of the current levels of climate finance, through agreement among Parties on concrete pathways and accounting methodologies for achieving of the collective goal by developed countries to mobilize USD 100 billion a year by 2020 and beyond, while striking a balance in the allocation of financial resources between adaptation and mitigation as a trust-building effort in the negotiations, and including a significant increase in grant-based support for adaptation and adequate support for capacity building and technology transfer, and stressed the importance of initiating substantive negotiations, immediately and prior to completion of the Paris Work Programme, on the long-term finance goal for the post-2025 period, so as to ensure scaled up, additional and predictable levels of public finance to implement developing countries ambitious nationally determined contributions. The Assembly further urged the Parties and the COP23 and COP24 Presidencies to expedite action on consultations involving specific needs and special circumstances of Africa, as mandated by COP22 to urgently reach consensus for support to the African populace especially the most vulnerable communities (women, youth and children) to benefit from the implementation of the Paris Agreement. The Assembly saluted the the diligence of the Members of the the Committee of the African Heads of State and Government on Climate Change (CAHOSCC) for the commendable political directive and guidance they provided that has concretised Africa’s solidarity and pan-Africanism at the negotiations and contributed to the adoption of the Paris Agreement on Climate Change as a result of strong, unity and united voice.